Motorola doesn’t have a high profile in the sports fitness technology world, but that looks set to change with the MOTOACTV. Despite being new to this market, Motorola has managed to produce an innovative device that combines all the key fitness technology elements. The MOTOACTV has GPS, ANT+ and Bluetooth to support its tracking for running and cycling. There’s a clever music player with the ability to learn what music motivates you and so help you improve. Data can be exchanged with your PC or Mac and even sent directly to a web site via Wi-Fi with no need of computer intervention. Finally, and importantly, the hardware design is very neat. The MOTOACTV is easy to use (for the most part), has a colour touchscreen, and can be accessorised with a belt clip, wrist strap, arm band and cycle mount and cadence monitor. One of the big plus points of the MOTOACTV is that it doesn’t look like a bit of sports or fitness technology. Instead it looks like a small portable music player and that’s precisely the impression given when you open the box. Inside there is the MOTOACTV unit itself, earphones with an abundance of silicone tips, belt clip, USB cable and in my case a non UK USB mains to mains power adaptor for charging. I actually charged over USB all of the time and this worked fine, though it is slower than using the mains. You also get a wrist strap that turns the MOTOACTV into something that looks more like a running computer. The MOTOACTV could turn out to be a fairly pricey solution if you want everything that’s on offer. The unit itself, as I’ve described above, retails for around £245. A bike cadence and speed sensor is £39, the Motorola Heart Rate Monitor the same price (though any ANT+ HRM will do). Then there’s the cross training accessory pack which includes a bike mount, arm band and mains power adaptor, again for £39. Measuring just 46mm square and 9.6mm thick the MOTOACTV easily fits into a pocket if you don’t want to use any of the accessories. And in fact, that’s how I used it much of the time, popped into a small front pocket on my joggers. The second most popular accessory for me was the belt clip, I did use the arm band a couple of times, but I’m not really a fan. Twisting the arm band round to see stats on the go was a pain, and the arm band position just isn’t very ergonomic for wearing headphones, either. There’s too much flapping cable. The MOTOACTV slots into the belt clip, arm band and wrist strap with gentle sliding actions. I found the wrist strap just a bit too large for me to wear comfortably, which is interesting as I’m used to wearing the Garmin Forerunner 310XT and the two are a comparable size. Maybe that’s just a matter of familiarity. I found getting the MOTOACTV out of the belt clip was a bit of a challenge as you have to pull it slightly upwards as you slide it out of the slot. It’s not a big problem – just a matter of mastering the technique, and perhaps the fit has to be pretty snug to avoid it slipping out. The MOTOACTV charges and connects to your computer via a microUSB connector, and if you’ve got a Motorola Android smartphone it can even pair with that to receive calendar alerts, SMS and take calls via its headphones. It can do this because it runs Android itself. I’m not sure this isn’t pushing the feature set too far, but some people might decide they like it. I wasn’t able to test the phone pairing feature as I didn’t have an appropriate handset. The implementation of Android here looks nothing like the version you see in smartphones, but it does mean that the MOTOACTV has a touchscreen with scrollable menus that feels intuitive to use. There are five main screens that you move between with a horizontal swipe. These give you access to settings, workout stats, time, music and notifications (from a paired handset). Tapping all but the time screen takes you to a whole slew of touch based menus for you to access all the features. The touch screen is responsive enough, but it does have to be said that because the display is quite small – just 1.6 inches diagonally – it can’t show many menu options at any one time, and because menus can be nested two or three layers deep you may have to delve around a bit to find everything that’s on offer. There’s a touch sensitive back button on the screen bezel that lets you retrace your steps out to whichever main screen you started from. The MOTOACTV is black with a silver metal back. I treated it fairly roughly during testing, and while it’s been sweated on a fair amount it hasn’t become scratched. The accessories have a black and red design that’s both distinctive and relatively attractive. As I’ve noted, the software side of things is not too much of a problem to get to grips with. The hardware side is where the only real problem surfaces. There are buttons on two of the edges of the device. On the top edge are Start and Music buttons. The Start button gives you start, pause and stop actions during a workout. The Music button has multiple functions including a double press to take you to the next song, double press and hold to scan through tracks, and even a triple press to go to the previous song or restart the current song. Not only is this multiple action quite a lot to remember as you are running along, it is also a bit tricky to achieve. The buttons are a bit small, only slightly raised from the chassis and not especially tactile. I found that whether working with the belt clip, wrist strap or arm band they were difficult to locate by touch alone. Obviously with the arm band in particular it was nigh on impossible to see the buttons, let alone press them. On another edge are volume and on/off buttons. These are smaller yet oddly a bit easier to find by touch, and the on/off button can be used to turn the screen light off and on. Next time round, I think Motorola needs to work out a way to make all the side buttons much more tactile. The MOTOACTV isn’t the kind of tech you can take out of its box and start using straight away to its best effect. You can charge it up, feed in your basic details (age, gender, weight, height), and have its GPS monitor track a run if that’s what you want to do, but really you need to go further to get the most from it and that involves hooking up to a PC or Mac and setting up MotoCast, and then getting to grips with the online services at www.motoactv.com. MotoCast is an application that can interact with iTunes for music and podcast synchronisation while also downloading software updates to the MOTOACTV. It also controls uploads to and downloads from www.motoactv.com where you can record training sessions and much more. It takes a few minutes to get all this set up and running properly, but it’s well worth the effort. MOTOACTV is highly dependent on its music integration to be a success. But it can also function as an everyday MP3 player. The iTunes sync is one way of getting data onto it, but you can also simply drag and drop music (and podcasts or other audio) as the internal storage will appear as a hard drive when you connect the MOTOACTV to your computer via USB.Whatever system you opt for, MotoCast will tell you how much data and of what type is taking up what proportion of the 8GB of memory. If you look closely you’ll see that some of the storage space is designated as being used by maps. The amount of space used by maps appears substantial, but don’t worry. It’s just the raw map data that the device uses to plot out a run on a small map that displays on the screen and unless you download new maps it remains constant. There’s a picture later in this review. You can, incidentally, download different maps for different parts of the world, from www.motoactv.com, so if you are a keen international traveller, the MOTOACTV can continue to map runs as you travel.Part of the initial configuration process also involves setting up your Wi-Fi account details so that data transfer can take place wirelessly allowing you to upload runs with the absolute minimum of fuss. Once you’ve done the initial setup your computer doesn’t need to be on for data to wing its way to your www.motoactv.com account – though your wireless router does need to be switched on of course. I’d recommend turning Wi-Fi on in the MOTOACTV itself only when you actually want to sync, as leaving it on all the time is an unnecessary power drain. Turning it on and off is really easy, though, just nip into the Settings area and select Flight mode. As time goes on, MotoCast can update the software on your MOTOACTV, and you can manually check for updates whenever you wish. In useIf all that sounds like rather a lot to get through before you start using the MOTOACTV in earnest, rest assured it doesn’t take too long and the manual walks you through all the options very nicely. There are a couple of additional things you can do with the device itself to help it perform to its best capability. One of these is to calibrate the device. You can do this for various exercise types – walking and running can both use a pedometer as well as the GPS and pedometer calibration will help you get a more accurate report of distance travelled. The MOTOACTV also works with Elliptical trainers, and you can calibrate stride length on an elliptical machine by setting your stride length manually. Music is a vital component of the MOTOACTV and there’s a small library pre installed to help get you started. Using music to help you train is hardly a new concept, but the MOTOACTV adds a couple of features that really can take the use of music to the next level in the shape of ‘Performance Music’ and the ‘Fitness Song’.Fitness Song is the easiest to describe. You designate one song as your Fitness Song and can then switch into it either by pressing an icon on the screen – which is a bit of a faff as you have to get to the right screen first, or by hitting a button on the bundled headphones. The latter option is very, very convenient, but I’ve two niggles. The first is that whichever method you choose it takes far too long for the fitness song to kick in. It might only be a few strides, but if you are looking for instant inspiration, you might lose that momentum.The second is that if you lose, or don’t like, Motorola’s headphones, you are stuck with the manual method of getting to your Fitness Song, and, like I said, that’s a bit of a faff. Considering it is a key feature of the MOTOACTV I’d like a button press combo on the device as another way in. Maybe pressing both volume buttons at the same time? Performance Music is a little bit more complicated. The MOTOACTV keeps an eye on the songs you listen to and which seem to make you run faster and it will send those it thinks are best for you to the Performance Music list. You can choose this whenever you want, and as you add songs and listen to them the list will change over time. It takes a few workouts to make the list for the first time, so you’ll be doing a few runs to random tunes before you can really see how well this feature works for you. If you just want a gentle jog along without worrying about pushing your performance, you could always listen to a podcast or turn to the FM radio that’s built in. The radio autoscans stations and stores them in memory, and you can even designate some stations as favourites. It seems like we’ve come a long way looking at the MOTOACTV and I still haven’t written anything about using it on the run. Both outdoor and indoor running are catered for, with the indoor variant using a pedometer to calculate distance travelled. I found outdoors that the GPS took a while to get a fix, even when I was starting from the same location as a run on the previous day. The wait was never too long, but even a minute spent standing in the cold and wind feels like a very long time. If you don’t want to wait you can just start running and the pedometer will calculate distance till the GPS kicks in.There are plenty of options for data to display during the different activities the MOTOACTV supports: running, cycling, walking, and using elliptical and step machines. 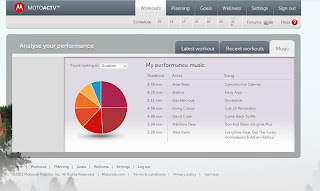 You can choose up to six criteria to display across two screens For running, for example, you can opt for things like average calorie burn, distance, distance to go (if you’ve set up a target distance), heart rate zone, elevation, lap pace, speed (current or average), time to go (if you’ve set a target time), and lots more. To start tracking you choose Quick Start and off you go.One feature we really like is that as well as doing auto lapping at set distance intervals you can also tap the screen to take a lap measurement. This is great if there’s a circuit you run regularly and you want to test your performance over time. Like top end GPS watches the Motorola MOTOACTV also has a virtual training partner. If you set this up with a target time you can chase it down and see if you can beat it. It could be set up with a target time you want to aim for, or your own personal best time on a particular circuit – it’s up to you. And again like top end GPS watches the MOTOACTV can be set to auto stop and start – handy if you have to spend time waiting for traffic lights to change, for example. In fact, apart from implementing a vibrating alert when laps are recorded – something which I find really, really useful, there’s nothing I can think of that is missing here. I’m not so excited by the audible tips that tell you through the headphones how well you are doing during a run, but if you respond to that kind of thing, it’s here for you. I mentioned earlier that the MOTOACTV will map runs for you. So here’s a map of one of the runs I completed during testing. You can’t zoom in and out of maps on screen, but maps are one of the many metrics that are uploaded to the motoactive.com. This web site can store training sessions and you can analyse metrics there, including seeing which songs make you perform the best. The array of statistics and analytics you can drill into here is amazing and over time you could, if you get really involved, build a fascinating library of data about your training. And as if that were not enough, you can also download training plans to the MOTOACTV. I’ve mentioned the headphones, and they deserve just a little bit more attention. The over the ear design means they fit very securely – I never had any problems with the earphones popping out during a run. They’re light too, and very comfortable to wear.It has to be said that the sound quality through them isn’t great. It was good enough for me – I don’t really hanker for great quality sound when I am running. But those who want top notch audio may wish to use a better headset of their own. Do so, though, and you’ll use that ability to click into your Fitness Song by pressing a button on the headphone cable. I’m a bit concerned about battery life, which seemed rather poor to me. For example, after two one hour runs with music and GPS running the battery was less than a quarter full. At that rate it will probably get most people through a half marathon, but very few people through a full marathon, and for everyday use you’ll need to make sure you keep it topped up. Maybe Motorola will be able to administer some software fixes to improve battery life. I hope so because as it stands this is a major issue. The MOTOACTV is nothing short of a revolution in sports tech terms. It offers a huge array of features – I haven’t even covered them all in this very long review. It has superb wireless synchronisation that doesn’t even need your computer to be switched on, to a web site that offers statistical analysis to the nth degree plus the ability to download training schedules and analyse the usefulness of your music as a training aid. It works for running, cycling, using elliptical and step machines and as a pedometer, thereby catering for a wide audience. It fits into a range of different housings for running and cycling uses. And it has some special music features in the shape of the Fitness Song and Performance Music. And this is only the first version of the MOTOACTV. If it weren’t for the dodgy battery life I’d be recommending the Motorola MOTOACTV hands down. The likes of Garmin and Polar need to pay close attention to what Motorola has in store.